An ocular bias permeates the pedagogy of design – exploring form, visual colours and textures; light and shade; connections and details to provide a visually aesthetically balanced design. This ocular bias in architecture and design has been discussed by thinkers and philosophers such as architect Juhani Pallasmaa and philosophers Peter Sloterdijk and David Levin. There is perhaps no other activity that takes place that best utilises all of our senses than participating in a meal. For this reason, the senses play a critical role in a setting that is designed for the consumption of food. As educators, undertaking the task of teaching how the senses play an essential role in restaurant design is also dominated by the ocularcentric. ‘The Sensory Meal’ project was developed for second year interior design students to participate in a haptic experience for consuming food. For the first four iterations of the project a sequential experience was created where the senses, initially deprived, were slowly revealed as a variety of courses were served. 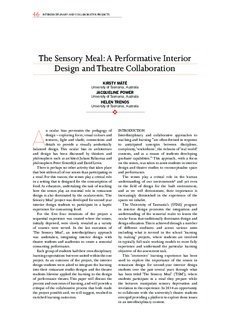 In the last execution of ‘The Sensory Meal’, an interdisciplinary approach was undertaken, integrating interior design with theatre students and academics to create a sensorial consuming performance. Each group of students had their own disciplinary learning expectations but were united within the one project. As an outcome of the project, the interior design students were asked to integrate the learning into their restaurant studio designs and the theatre students likewise applied the learning to the design of performance theatre. This paper will discuss the process and outcomes of learning, and will provide a critique of the collaborative process that both made the project possible and, we will suggest, resulted in enriched learning outcomes.